Santa Clara, Calif., March 12, 2014 – A new direct-diode laser system from Coherent Inc. (Santa Clara, CA) (Nasdaq: COHR) now offers higher power, which translates into increased throughput for applications in metal cladding and heat treating. 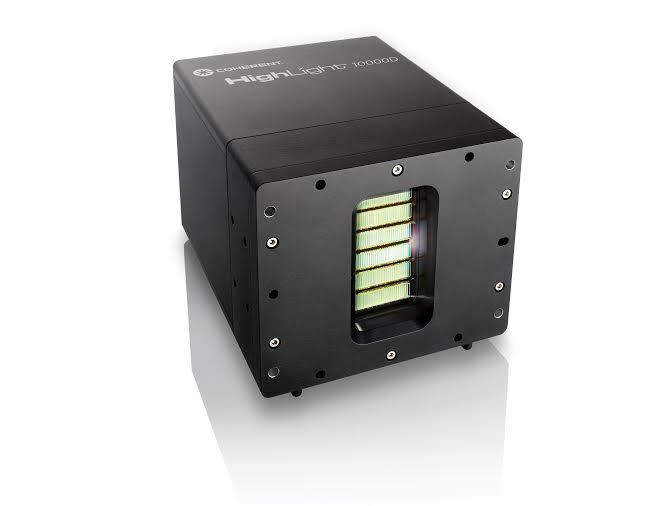 The new HighLight™ 10,000D outputs 10 kW (at 975 nm), and can be configured to deliver a wide variety of interchangeable beam shapes (with widths from 1 mm to 12 mm, and lengths from 6 mm to 36 mm) to optimally match specific processing requirements. When combined with Coherent’s pressurized or gravity feed powder nozzles and systems, this increased power level enables higher deposition rate cladding (>20 lb/h), or the use of larger spot sizes for heat treating. In addition, Coherent offers a pyrometer for monitoring work surface temperature for closed-loop control of laser power during heat treatment and cladding. HighLight customers have access to Coherent’s applications development lab and engineering staff. This team helps to configure a system that matches each customer’s precise requirements, and can identify optimum processing parameters for cladding, heat treating and welding applications. Founded in 1966, Coherent, Inc. is a world leader in providing photonics based solutions to the commercial and scientific research markets, and is part of the Standard & Poor’s SmallCap 600 Index and the Russell 2000. Please direct any questions about this press release to Klaus Kleine, product manager, at (408) 764 4860, e-mail [email protected] . For more information about Coherent, including product and financial updates, visit our website at http://www.Coherent.com.